Deptford history books are an invaluable resource for the family historian and local historian, as well as being interesting in their own right. Below, we display two dedicated Deptford history books, and also one – “A Murder in Deptford” – which is a historical novel set in Deptford in 1905, and which contains a great deal of information on Deptford and the surrounding area. We also include old maps of Deptford. 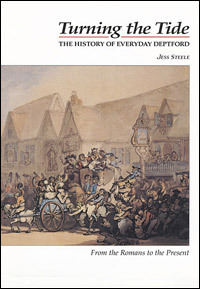 Turning the Tide was the first Deptford history book to be published in over a hundred years (1993), and is very much a social history of Deptford. It covers Deptford history from Roman times up to around 1990. From the Battle of Deptford Bridge (1497) to the Battle of Clifton Rise (1977) this book races through the ages bringing Deptford’s past to life and offering lessons for the future. We also include maps because they are a valuable source for making sense of Deptford’s location and street names. Of particular interest are the Godfrey Edition maps, which are printed at a large scale, have street names included, and have the bonus of extracts from directories on the reverse, showing the names and proprietors of shops, doctors, etc. At what time the parish adopted its present name is not certain, but it could scarcely have been before the Norman Conquest, for, as has already been seen, in the Domesday Survey, it is spoken of as Meretone, and in the Saxon Chronicle, A.D. 871, it is also called Meretun. Lambarde, in his “Perambulations of Kent, 1570,” says this place was called “West Greenwiche,” in ancient evidences, and in Latin “Vadum profundum”. 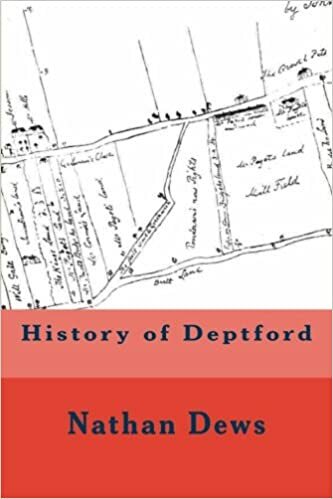 It received its modern name of Deptford, after the Norman Conquest, from its position on the river Ravensbourne, which being subject to tidal inﬂuences rendered the fords at certain times, of great depth. As tenements were erected along the banks of the river, it obtained the addition of Stronde or Strand. We also frequently find it termed Depeford-le-Stronde and Deptford-Strond, alias West Greenwich, from its relative position to Greenwich; in course of time, however, this latter appellation was disused, and it retained its present name of Deptford. We find the word spelt variously in many old books, manuscripts, and on the Deptford tokens, viz: Depforth in Mackyn’s Diary, A.D. 1551; Depforde in 1555; Depeforde in 1570; Depford in 1572 and 1649; Detford in 1648; Depthford in 1665; Deadford in 1665; Dedford in 1667 and 1673; Deptforde on an old token, no date; Depthorde in the Harleian Manuscript; Debtford in an old ballad, printed in black letter in 1675, entitled, “The Debtford Frolick, or a Hue and Cry after the Shag Breeches,” of which three different editions are in the British Museum. On an ancient monument in St Nicholas Church we find it spelt Deepford. The Evelyn family is supposed to be a branch of the Norman family of Ivelin. John Evelyn, author of “Sylva,” states that there were some of this name both in France and Italy, written Ivelin and Avelin; that in old deeds he found the name written Avelyn, alias Evelyn, and that a member of the family was taken prisoner at the battle of Agincourt, 25th October, 1415. In the reign of Queen Elizabeth the representative of the English branch of the family was George Evelyn, of Long Ditton, Kingston, and Wotton, Surrey, Esq, who died the 29th of May, A.D. 1603, aged 77 years, leaving, besides other issue, four sons. His first wife, Rose, daughter and heiress of Thomas Williams, brother and heir of Sir John Williams, Knt., was buried at Long Ditton, 21st July, 1577. His second wife, Joan Stint, died in 1613, and was buried at Wotton. From the second son, John Evelyn, of Kingston, Surrey, the present head of the family, William John Evelyn, Esq, is directly descended; the youngest son, Richard Evelyn, succeeded to the Wotton Estate. Richard married Ellen, daughter and heiress of John Stansfield, of Lewes, in Sussex, Esq, by whom he had issue: George, of Wotton; John, of Says Court, Deptford; Richard; Elizabeth, married to Thomas Darcie, of Dartford; and Jane, married to William Glanville, of Devon.Richard Evelyn, Esq, died 20th December, 1640, and was succeeded by his eldest son, George, who died without male issue in 1699, having devised the Wotton Estate to his brother John, who had become possessed of Sayes Court (or more properly Say’s Court), by marrying Mary, only daughter and heiress of Sir Richard Browne, son of Christopher Browne, by Thomazine, daughter of Benjamin Gonson, widow of Captain Edward Fenton, and sister of the Lady Katherine, first wife of Admiral Sir John Hawkins. John (Sylva) Evelyn, Esq, had five sons, four of whom died in infancy at Sayes Court, and three daughters, Mary, Elizabeth, and Susannah.Mary died unmarried, March 17th, 1685, æt 19. Elizabeth was married to Sir John Tippet, and Susannah to William Draper, of Adscomb, near Croydon, in Surrey. (For biographical sketch of `Sylva Evelyn,’ see chapter on “Parish Worthies”)John, eldest and only surviving son of “Sylva” Evelyn, was the ingenious author of several books and poems (see “Parish Worthies”); having married Martha, daughter and co-heiress of Richard Spencer, Esq, died in his father’s lifetime, March 24th, 1699, leaving one son, John, and one daughter, Elizabeth, who was married to the Hon. Simon Harcourt. On the 28th of October  we ﬁnd entered in the diary, “The pestilence, through God’s mercy, began now to abate considerably in our towne. During 1666 there were 522 persons died of the plague in Deptford,” making a total of 928 for the two years, which must have been a large proportion of the inhabitants of the town at that period. ln the parish registers are lists of persons who had been touched for the King’s Evil during the years 1684-88. In 1686 the number amounts to 82. Three insurgent armies have crossed here on their march to London, viz: That under Wat Tyler in 1381; Jack Cade in 1450; and Sir Thomas Wyatt in the reign of Queen Mary. Sir Thomas Wyatt encamped with his army in Deptford from Friday afternoon till Monday morning. But the most memorable event connected with Deptford Bridge was the sanguinary conﬂict between Royal troops and Cornish rebels in 1496. On the 11th December, in the 13th year of the reign of William III, a Royal Charter was granted to William Yarnold and Robert Watson, their executors, administrators, and assigns, empowering them to take water from the River Ravensbourne, and to break up the roadways within the Royal Manors of Sayes Court and East Greenwich, and to lay pipes for the supply of water to the inhabitants of the said Manors for a period of 500 years, and prohibiting any other person from breaking up the roads for supplying the inhabitants; and conferring upon the holders of the patent the sole power and privilege of supplying them with water from the Ravensbourne or elsewhere during that period. This was the commencement of the Ravensbourne Water Works. A water mill was erected in Mill Lane, formerly Dog Kennel Row, the machinery being made by that eminent engineer, Smeaton, who built the first Eddystone Lighthouse, on principles of his own invention. There were two wheels, one for grinding corn and the other for raising water. On the 20th June, 1809, extended powers were obtained by Act of Parliament (49 Geo. III, cap. 189), and the Ravensbourne Water Works then became merged into the company of proprietors of the Kent Water Works. At the present time the Company supply an area of about 120 sq. miles in the County of Kent. Its limits, having been extended by subsequent Acts, now include the district from Rotherhithe, down the Thames as far as Gravesend, and inland as far as Dartford, Greenhithe, the Cray Valley, and Orpington, Deptford, Greenwich, Woolwich, Lewisham, Bromley, Chislehurst, &c., and its supply of water is unequalled for its purity by any company within the metropolitan area. Steam power is now used for pumping, and about 9,000,000 to 11,000,000 gallons are supplied daily. Deptford, doubtless, owes its rapid increase in population and importance to its extensive railway facilities, being intersected by the L.B. & S.C., the North Kent (opened in 1849); the L. C. and D., and the Greenwich lines, the latter being the oldest in the metropolis. The first train was run from Spa Road to Deptford 28th February, 1836; from Bermondsey to Deptford about October, 1836; from London Bridge to Deptford 14th December, 1836; and from London Bridge through to Greenwich in 1838. There are no less than seven stations in the parish, with just as many more within almost a stone’s throw of its boundaries. The Croydon Railway was worked in the first instance by atmospheric pressure, and was built on the site of the old Croydon Canal, with its numerous locks and lock houses, one of which, situated on the Brockley Tips, has only just disappeared. The Croydon Canal nearly occupied the site of the L.B. & S.C. Railway, passing through Brockley between the shop of Mr R. Henderson, the baker, and Flora Cottage, the residence of Mr Griffin, landscape florist. This cottage, with the adjoining Bank Lodge, occupied by Mr C. Cox, gardener, are the only remnants left to show the former rusticity of the Deptford portion of Brockley. I hae recently bought two reprinted books on early Deptford, including your one by Nathan Dews and wondered where it would be possible to obtain some good illustrations of Deptford in the mid 19th century. Do you know of any local library or museum which sells copies of these? I am particualrly interestedin the areaaroun Hyde Street and the dockyard itself.